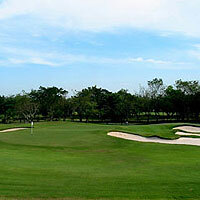 Recently redesigned by Schmitt and Curley, Muang Kaew has developed into a first class facility. Wide fairways give players some respite for approach shots, most of which are to slightly elevated greens that are difficult to hold. The course seems to get better by the hole with the back nine offering a great variety of holes starting with the exciting risk-reward Par 5 13th, where players have a blind tee shot and an approach shot over a large and intimidating water hazard. Even shorter hitters can bite off a bit of the dogleg and have a go at the green, although you'll need to carry the ball anywhere between 250-150 yards over the water. The nine ends with a deceiving Par 5, where any approach shots short and right will have a watery ending. Close to the city if you go at the right time, however the recent contruction of a highway through the middle of the course doesn't do it any favours. The service in the restaurant is very disappointing and detracts from an otherwise enjoyable golf experience. The owner recently ousted Siam Golf Properties from management contract.